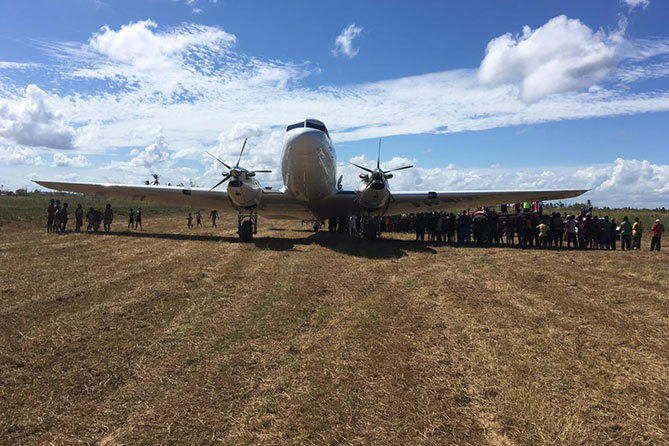 MAF’s work in response to cyclone Idai in Mozambique has shifted from disaster relief to long term development as arrangements for work and approvals are made so that a new airstrip could be opened at Buzi to support a Samaritan’s Purse field hospital that has been established there. I arrived in Mozambique on Tuesday, April 2, on the Samaritan’s Purse DC 3 and quickly jumped on a Mercy Air helicopter flight to Buzi airstrip with Rick Emenaker of MAF, the two DC3 pilots, and a guy named Cameron with SP who was responsible for finding a tractor and did the initial rough clearing of the airstrip. We did an assessment of the surface of the airstrip and were confident that it would be usable once the grass was cut and it had another day or two to dry out. My Portuguese came in handy as I was able to speak to the local Mozambican men at the airstrip and negotiate a price for them to hire 20 workers with katanas from the nearby town of Buzi to cut the grass all the way down to the dirt. I gave them an optimistic timeframe of less than 48 hours to complete the work. After some assurances they would have it done, we returned back to Beira. I began working my contacts with Civil Aviation that afternoon to try and obtain permissions to land on the airstrip, and was initially told on Wednesday morning that we would have to go through the formalized process of approval with a full inspection by civil aviation. Rick and I also had decided to work through INGC, the Mozambican governmental organization in charge of disaster response, to see if they could use their influence to push permissions through, so I kept trying to work it through on that angle. By Wednesday evening, less than 24 hours since we had initially visited the Buzi airstrip, the local people were able to completely cut and clear the airstrip and have it ready for final inspection — a full day earlier than I anticipated! On Thursday morning I received verbal permission from INGC that civil aviation had said we could use the airstrip. However, civil aviation had not issued a written authorization, which I knew the flight dispatch office would need in order to approve the flight plan. After checking back in with INGC throughout the day and not having a written response I decided to try to push through with the flight dispatch office just to test the waters to see if we could make this happen. I talked to the dispatcher who referred me to his supervisor who referred me to her supervisor who said he had been contacted by civil aviation and they would have to inspect the airfield before we could use it. After some hesitation I was able to get one of the dispatch officials to commit to flying to Buzi airstrip with me by Mercy Air helicopter on Friday morning to inspect the airstrip. We only had 30 minutes on the ground and walked up and down the airstrip while I did periodic tests of the surface and assured the inspector what an amazing runway this was. It was also fortunate that we had a box of medical supplies on board that were for the hospital, so we ended up landing in a soccer field nearby and passed the supplies on to the medical support team. I think it was really good for the inspector to be able to see the hospital from overhead and hear a story about an emergency c-section that had occurred the night before which saved a woman’s life and see how this airstrip would practically meet the needs of the people from the town of Buzi. The only requests the inspector had was that I install a windsock and paint some runway markers on the ground which we intend to accomplish today. We returned to Beira and, to my surprise, two hours later I received an official NOTAM from civil aviation declaring the runway to be open from now until July 31. This is a process that in my experience would take at least 6 to 12 months with multiple requests from civil aviation to change various things. 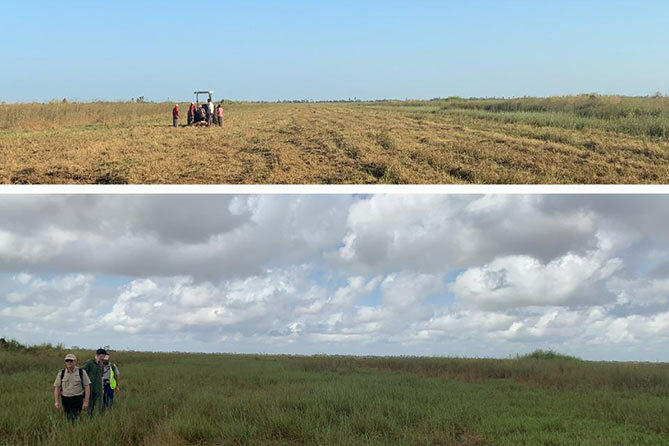 But this airstrip went from an overgrown grass field that hadn’t been used in years to an officially approved airstrip in a period of five days. I don’t think this would have been possible without the joint partnership between Samaritan’s Purse, Mercy Air, and MAF. The SP DC3 is scheduled to fly into Buzi with multiple loads over the next five days. A smaller aircraft arrives next week to provide ongoing support over the next one to two months while the field hospital operates. What a wonderful testament to God’s hand on this process with like-minded organizations working together to make an impact on the people in the town of Buzi in the name of Christ! Story and photos by Steve Simpson, MAF Program Manager in Mozambique.